When Should Sedum be Pruned? When to prune sedum (Sedum spp.) is a question that is not answered with just a simple date. Pruning the flowering perennial, which grows in U.S. Department of Agriculture plant hardiness zones 3 through 10, depends on the size of the plant, the variety and how you want it to look. A compact, low-growing sedum requires different maintenance pruning than a tall, late-blooming variety. Before you prune your sedum, disinfect your pruning tools. Pruning shears are best for cutting back tall plants, while snips work well for pinching or clipping leaves. After brushing any dirt from the tool blades, disinfect the blades by soaking them for at least five minutes in a household disinfectant. After removing the tool from the disinfectant, rinse the blades with clean water and let them dry before using them on your plants. Repeat the disinfecting process before pruning another plant to avoid spreading disease. To encourage branching and low growth on young plants, pinching is recommended. To pinch the plant, use your fingers or pruning snips to remove the center growth from the top of a stem. Take care not to damage the buds or small leaf sets on either side of the center growth; these buds are where the branching will occur. Pinch back new plants when they are about 8 inches tall. You can still pinch off up to 2 inches after blooms start to appear, but it will delay flowering. The result is sedum with more horizontal growth, less vertical growth and added fullness. A more severe pruning is required to encourage bushiness on an older plant that has gotten top heavy or leggy. To encourage new plant growth and get a fuller plant, cut the sedum back by one-half in May or June. New flower buds will form on the cut stalks, so you won't be sacrificing any of the showy display for the sake of a neater looking plant. Choose a point about halfway down a stalk and just above a set of leaves to make your cut. Cut cleanly through the stalk with sharp pruning shears, taking care not to damage the leaf set. Repeat with each stalk until the sedum is a uniform height. Some varieties of tall sedum, such as "Autumn Joy" (Sedum x "Autumn Joy"), which grows in USDA zones 5 through 9, flower through the winter and need cut back in late winter or early spring. You can cut the sedum back in winter as soon as the flowers fade or any time after that until you see green peeping from the ground in spring. Cut the entire plant back to ground level using pruning shears or break the stalks at ground level by hand. In the spring, the sedum will re-emerge from the roots. Some types of pruning are necessary year-round. This includes pruning out dead plant growth and cutting out diseased plant material. 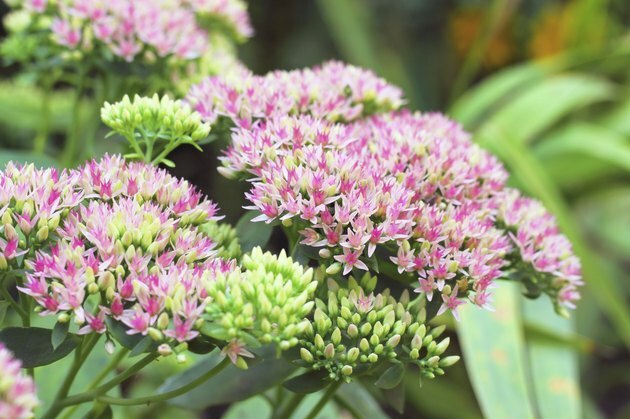 Removing these from your sedum as you see them will help keep the plant looking its best, keep it healthy and less prone to fungal or insect infestations. Cut dead stalks back to the base of the stalk. Pull any dead leaves when you spot them. Remove diseased portions of the plant to keep disease from spreading. Make sure you cut back far enough that you are leaving only healthy plant material. Make the cut just above a leaf set for new growth. Do not compost diseased sedum material.